You don’t need to appreciate classic rock to agree that waiting rooms take their toll on more than just time. We’ve all been there, the rows of padded chairs with wooden armrests, the piles of magazines, the TV, and the plant in the corner that may or may not be plastic. It’s these elements, and more, that make up the traditionally dull waiting room experience we know so well. But does it have to be dull? Sure enough, plenty of businesses and offices work hard figuring out how to make a waiting room more inviting, and put forth a lot of effort into improving their lobbies for their clients. But no matter where you go, whenever you end up having to wait for more than a few minutes you’ll likely see a TV. And there’s a reason for that. TVs are an effective distraction. TVs draw people’s attention, and they’re a familiar element that we’re used to looking at on a daily basis – providing a quiet atmosphere with the comfort and white noise of what’s on. While televisions are great in that respect, there are many reasons that cable and satellite TV are not the best options for your office. When you’re waiting to be seen by someone, you aren’t necessarily invested in a long program when you’re expecting to miss some, or most of it, as soon as you’re called away. And in the case of having the TV turned to any one station or giving visitors control over the remote, with a waiting room full of people it’s impossible to cater to them all and it’s likely that someone is going to get alienated. So what’s a business owner to do about that? It’s Relevant TV for Dentists and It’s Relevant TV for Medical Offices work to address those issues and more. Each custom TV network airs original content pulled from a vast library of categories tailored specifically for the practice it’s in. The segments run for two and a half minutes on average – meaning they’re brief enough to cater to an audience with limited focus, and the categories are varied enough that everyone is bound to see something that interests them on some level. IRTV compliments an atmosphere in which people are looking for a distraction and aren’t there to be entertained. Going beyond aired content, the service can also be used to reach out to those people in waiting. Posts, photos, and even videos from your social media can be uploaded and played for visitors to see. 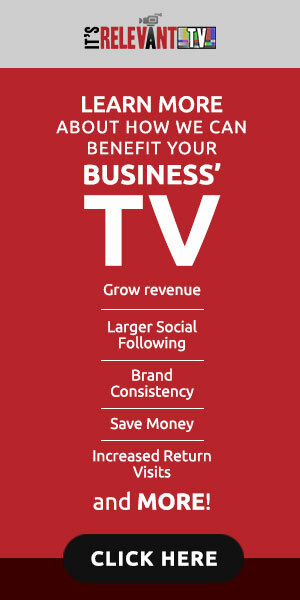 Whether you’re introducing your staff, highlighting local events, or even showcasing other services your business provides; it’s worth taking a look at: It’s Relevant TV.